The SEAA Southern Inter-County Cross-Country Championships 2018 will be held on Saturday 8 December at Horspath, Oxford. Reserve team members have also been notified. Reserves are not required to travel, but if a place becomes available David or Kathy will contact you as soon as possible. Hampshire Vests can be purchased for £15 or borrowed on the day. David Vosser suggests that athletes arrive approx. 70 minutes before their start time to give plenty of time to collect numbers from the Hampshire tent and have a look at the course. The start and finish are on playing fields. The course heads out over some open farmland and back through a woody section. The course has been muddy in the past and is suitable for spikes. The weather forecast is dry but cold (3ºC) and staying windy. Horspath Sports Ground is to the east of Oxford just off the Eastern Bypass (A4142). Its postcode is OX4 2RR. Use BMW plant car park. 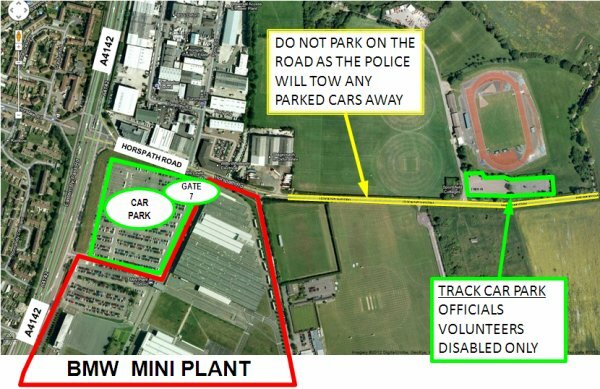 Enter via gate 7 on Horspath Road and please park in marked bays.